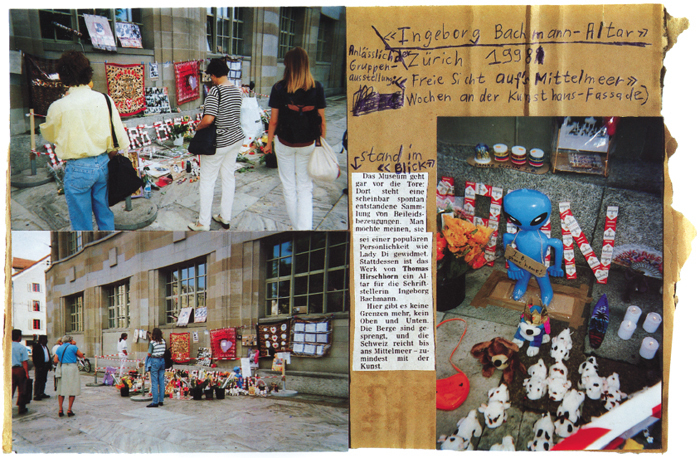 Page from Thomas Hirschhorn’s 33 Ausstellungen im Öffentlichen Raum, 1989–1998 (33 Exhibitions in Public Space, 1989–1998), 1999, booklet, 8 1/4 x 11 3/4". All works by Thomas Hirschhorn © Artists Rights Society (ARS), New York/ADAGP, Paris. STRONG ASSERTIONS are the most prominent feature of Thomas Hirschhorn’s art. He always acts with great decisiveness. This raises many questions, some of whichone might hopecould be answered by the publication of his writings. It turns out, however, that he took the same approach to the the texts collected here. Eschewing argument, Hirschhorn aggressively condemns all relativism, claiming that art does not need to be “put in context.” Rationalizations, qualifications, and other civilian affectations are almost entirely absent from these texts. Instead, there are assertions, proclamations, manifestos, and other very masculine gestures of impatience, as well as, of course, intensity: Hirschhorn’s most prized value. 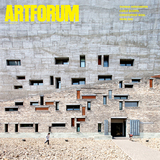 If the lack of explanation in the book’s first chapter, titled “Statements and Letters,” can be chalked up to the artist’s intimacy with his correspondents, the same style characterizes a later section titled “Projects.” In reference to one of his first shows, at a squat in Paris called the Hôpital Éphémère, Hirschhorn writes: “This exhibition shows that everything is possible; that was its purpose. I said to myself: With my work I do what I want. I have no doubt that it’s possible, but is it really good? I want my work to be good without any possible misunderstanding (I don’t care if it is understood or not).” In his discussion of later works, the contradictions are no longer so obvious, but they are equally inescapableas the necessary result of the discourse of intensity that comes from his self-positioning as tortured artist. At times he seems to notice that he is contradicting himself and adds a claim along the lines of “art can do anything,” without offering any further comment on what this art that can do anything is, or whence it derives this wondrous power. Not until the fourth chapter, which focuses on interviews, is the difficulty the reader faces in trying to understand Hirshhorn’s rationale partly alleviated. For example, why are all four of Hirschhorn’s Monuments, 1999–2013, devoted to big names in philosophy? He seems to have chosen Spinoza, Deleuze, Bataille, and Gramsci simply because he finds them impressive; any further reasons are left implicit. Wouldn’t the Bataille Monument, installed for the 2002 Documenta in a deprived part of Kassel, maybe have served its purpose better as a “Mother Teresa Monument,” if the primary objective of its creation was indeed to achieve, as Hirschhorn claims, “friendship and social interaction”? The artist comments: “There was not a single book in the library by or about Georges Bataille, but [rather] books on the themes of Georges Bataille, because I wanted it to go beyond him. And ultimately I never talked to the youngsters I worked with about Georges Bataille. . . . It is possible that, in the end, Georges Bataille’s name and his work could be replaced by others.” So it is just as one always suspected: The names honored by the monuments are like rock-star posters in a teenager’s bedroomprivate documents of veneration, or assertions of cultural sophistication. It is on such fundamental points that the interviews are helpful. At least to some degree, these conversations also expose the kernels of argument lurking in Hirschhorn’s truculent rhetoric. In an exchange with Jacques Rancière, the artist describes his project as “the simultaneous affirmation of the autonomy and the universality of the work and the ‘non-exclusive’ audience for which the production of the work is intended.” This sounds more interesting and plausible than the usual intellectually impoverished opposition between autonomous and social art: What Hirschhorn proposes is giving up neither, in fact even strengthening the concept of autonomy, but without sacrificing the social meaning of the work made under such conditions. But how aesthetic autonomy and a nonexclusive audience came to be opposed in the first place, and why this is a political and not a conceptual history, is not to be learned from Hirschhorn’s statements. Moreover, one cannot produce such an audience simply by wishing it into existence, even if Hirschhorn believes that “nothing is impossible with art,” as he confides to Benjamin H. D. Buchloh in a 2003 interview. And if one steers the existing art world into the everyday surroundings of those it excludesas was the case in Kasselthe latter are inevitably objectified into exhibits that encourage the viewing habits instilled by reality television. And yet, as a whole, the book does make Hirschhorn’s position discernible. He wishes to campaign for art and artists with all the privilege accorded these categories, while also inscribing his work in the traditions of form and content proper to critical art. But we cannot spare him from the most important relativization, the historical: In the 1980s in Europe, strong assertions, apodictic certainty, and art shamanism were the order of the day. These were the key characteristics of the punk resistance against the art of the ’70s, which was seen as having become bogged down in relativism, too bureaucratic and complicit with the dominant politics of social democracy. During the course of the ’80s, however, this mind-set lapsed into one of machismo and vacuousness, and was soon afterward called into question by the emergence of neo-Conceptual and feminist political art in Europe. Hirschhorn, however, combines the ’80s machismo of intensityand the associated romantic notion of the artistwith later struggles to engage with the public sphere and the everyday. To come to some kind of synthesis, it would be necessary to reflect the historical nature of this antagonism, instead of retreating to the magic of art, or even trying to reinvent it. Diedrich Diederichsen is a Berlin-based critic and a professor of theory, practice, and communication of contemporary art at the Academy of Fine Arts Vienna. Translated from German by Elizabeth Tucker.